The twin engine O-2 aircraft was designed and built by the Cessna Aircraft Corp. The O-2 is the military version of the Cessna Model 337 Super Skymaster. In late 1966, the USAF selected a military variant, designated O-2. The O-2 first flew in January 1967 and deliveries started in March that year. Production ended in June 1970 for the USAF. The O-2 was distinguished by its twin tail booms, tandem-mounted engines and tractor-pusher propeller arrangement. 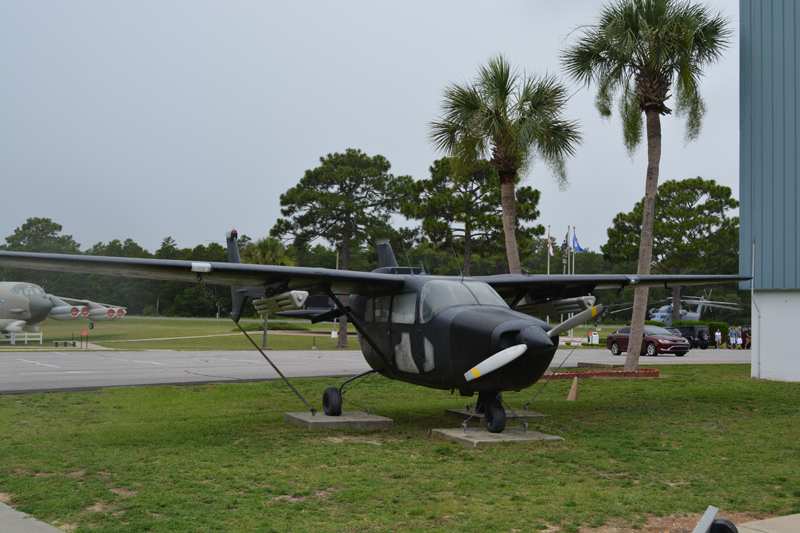 The O-2A was equipped for Forward Air Controller missions such as Visual Reconnaissance, Target Identification, Ground – Air Coordination and Damage Assessment. The moderate performance and light ordnance carried occasionally made these missions quite dangerous. The O-2B was similar to the O-2A but were equipped for Psychological Warfare, the O-2B had the capacity to disperse paper leaflets in flight and carried Air-to-Ground Broadcast gear consisting of loudspeakers mounted under the wings. The O-2B was used extensively during the Vietnam War. This O-2A S/N 68-6864 is painted with the black paint scheme used to fly night missions over sites on the Ho Chi Minh Trail in Viet Nam. It was assigned to various units during the war in Southeast Asia from Jan 1968 to Mar 1972.